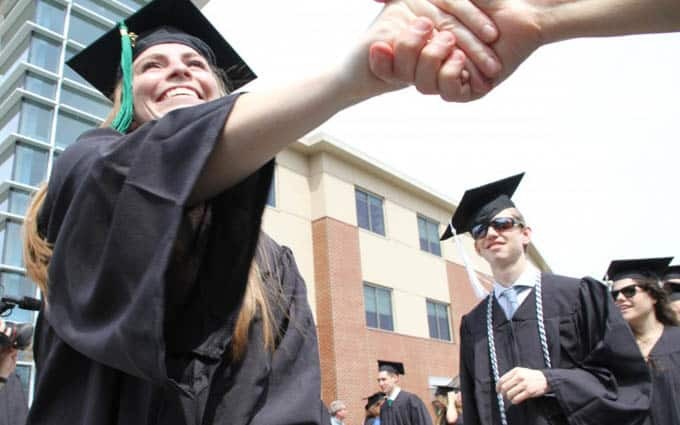 CASTLETON — The largest class in Castleton College history passed across the stage at its 228th commencement ceremony on Saturday, bringing to close the 2014-15 academic year. Tim Donovan, former Chancellor of the Vermont State Colleges, addressed the more than 3,500 people in attendance and thousands more watching online. Donovan spoke about the sweeping technological changes the world has experienced, and the importance of education in the face of change. As has become tradition, Castleton President Dave Wolk began the proceedings with the presentation of three awards. Retiring professor of athletic training, John Feenick was awarded the Alumni Association Outstanding Faculty Award, given annually to the faculty member whose excellence in teaching influences students well beyond graduation. Rachel Orr was honored with the Leonard C.Goldman (’59) Distinguished Senior Award, an annual honor given to the graduating senior who has excelled in and out of the classroom, contributed to community service, and served as an example to others. J. Douglas Sinclair, part-time faculty member in physics, was awarded the Endowed Outstanding Part-time Faculty Award.